This cotton kikoy short set is sized to fit a child between eight and nine years old. To assist you with the fit we provide these measurements. The top measures 14″ from shoulder to shoulder, 18″ across the chest and 22″ from the shoulder to hem. 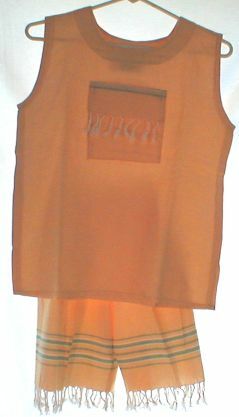 The top front pocket has a row of hand knotted fringe. The shorts have an elastic waist which measures 18″ relaxed and 30″ extended. There are two side pockets. It is 16″ from the waist to the fringed hem.